Ha haa Terra ,and doesn't Truffle look intelligent, apart from looking cute of course. Hi Rose .. woof, woof .. I told Truffle you said he looks intelligent in those glasses ..:o))) Nice pic of you on your avatar photo ! Lol. Crissue and Pansypotter .. This is cute, I love it LOL!!! Balcony you're the witty one tonight ... Truffle would approve... Lol. Not as good as the bird books I used to look at a few years ago terra haha, all the best for 2012 to you & yours. Sweeeeeeeeeeet honey, Truffle. Why he reminds me of Elton John? Yes .. you're right about Elton John ... Lol !!! I'm not sure which is the most ridiculous .. Thank you.. I hope you had a great time. LOVE IT !!!!!! You look so sweet Truffles, and Your duck yellow specs are definately something to die for, I would love some of those, did they come out of your 'Quacker'? 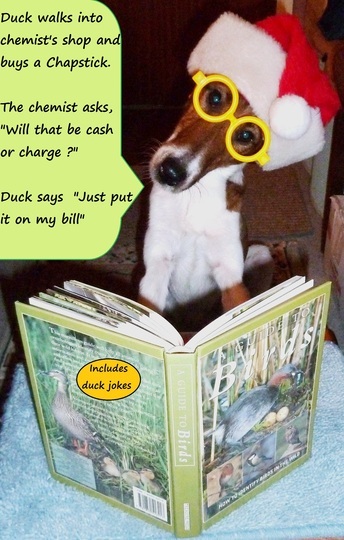 Also your joke was brilliant and amused us all here, ...much better than the jokes that you find in the Quackers. A Very Happy New Year everyone! Same to you Tt, enjoy the rest of it! FAB-U-LOUS!! I am always tickled pink by their (and your!) antics TT. Thanks for cheering me up Truffle! It`s a cracker TT, hugs to you all.